Were you in Scouting? I was a Girl Scout Junior in 4th-5th grade. I still can remember wearing my sash to school, and envied the girl who had the full uniform and sash filled with badges. (At that time the uniform had green pants, and a shirt with the girl scout trefoil all over it.) One of my favorite memories was the big camp out, making a sit upon mat, and washcloth bags to boil my mess kit in. I still remember the first time I had 'smores and some how managed to sit on a melted marshmallow, that managed to get all over my pajamas and sleeping bag. I worked feverishly to earn badges, and was the top cookie seller in our troop that year. (My parents had hundreds of boxes of cookies sitting in our living room, and sorting them all out was a huge undertaking.) I loved the Girl Scouts, and the many skills I learned along side my friends. I did not know anything about Juliette (Daisy) Gordon Low, prior to reading On My Honor, other than she founded the Girl Scouts. I loved reading about Daisy, through the research, words, and knowledge of Shannon Henry Kleiber. I was unaware of that the founder of the Boy Scouts, a shared meal, and a need at the time to form a group to support young women; evolved into the modern day Girl Scouts. It is hard to imagine a world without scouting, and the opportunities now available to our children, is due in part to the hard work of countless volunteers and parents who give their time and talents. This book teaches the history of Girl Scouts, the personal adversity of Daisy, and life lessons that apply to all of us. As a mother of boys, my days of Girl Scouting are over, but lessons gleaned from this book are numerous! 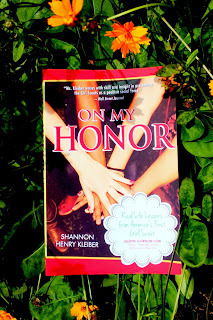 On my Honor is not a traditional biography. It is more of a modern history because it combines stories about Daisy, experts' advice and ideas, and Kleiber's own experiences as a Girl Scout. As the organization celebrates the 100th anniversary of its founding throughout 2012, On My Honor gives today's women the inspiration of another woman who has influenced millions, who gave the girls a voice before they had a vote. Why the iconic Girl Scout cookies are the modern day lesson in learning about finances and the value of work. How Daisy used her own handicap --deafness--to argue for equality and inclusivity among Girl Scouts. How Daisy's marital turmoil and a chance meeting with Boy Scouts founder Sir Robert Baden-Powell after her divorce inspired her to create the Girl Scouts. Why Daisy was a feminist, environmentalist, and inspirational author well ahead of her time. The story of Daisy is that of every American woman, of finding herself. On My Honor brings Daisy's classic advice to a new audience, through a modern lens. A portion of the proceeds of On My Honor will be donated to the Girl Scouts of the USA. About the Author: Shanon Henry Kleiber is a former staff writer and columnist for the Washington Post. She has also written for the Christian Science Monitor, Washington Technology, American Banker, and Edible Madison. Kleiber is also the author of The Dinner Club:How the Masters of the Internet Universe Rode the Rise and Fall of the Greatest Boom in History (Free Press/Simon & Schuster, 2002). Kleiber lives in Madison, Wisconsin, with her husband and two daughters, where she is a Girl Scout leader of her older daughter's troop. For more information, visit www.shannonhenrykleiber.com. *I was given On My Honor to review via Sourcebooks Publicity, all thoughts and opinions are my 100% own.